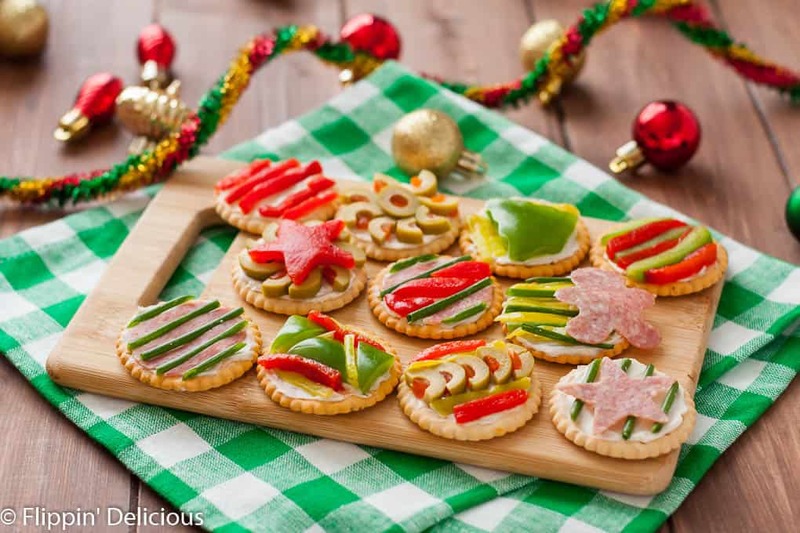 These Ugly Sweater Party Crackers are the perfect addition to your holiday party! 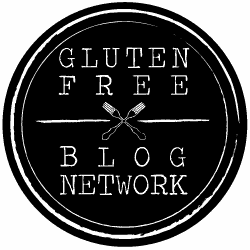 Made gluten-free with Glutino Crackers. This post is sponsored by Glutino. As always, all opinions are entirely my own. Thank you for supporting Flippin’ Delicous™ and the companies I work with. One of my favorite things about the holiday season, aside from gift giving, peppermint, eggnog, and singing carols, is ugly holiday sweaters! When I was engaged to my hubby-to-be, my family was really into cross-fit. There was an ugly sweater WOD (workout-of-the-day) that sent my mom, 3 of my sisters and I frantically running through the thrift store moments before our WOD began, to find the ugliest holiday sweaters imaginable….to exercise in. I wish I had that sweater still! It had glittery blue thread woven throughout it. It was totally me! It was the kind of ugly holiday sweater that I would wear to just cuddle up on the couch with a book. But far better than ugly sweater wods or ugly sweater reading, is ugly sweater parties! Of course the event has a potluck aspect to it. Not the traditional potluck, but a table full of as many snacks and appetizers as you can imagine. 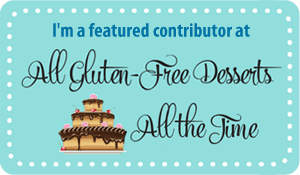 I always bring my own appetizer to contribute, just in case there isn’t something gluten-free in the spread that I feel comfortable eating. This year I thought, what would be a better appetizer to bring to an ugly sweater party than crackers that look like ugly holiday sweaters? Not only are these ugly sweater gluten free crackers fun and festive, they are also super easy to make! All you need are some Glutino Crackers (I used Glutino Original, Cheddar, and Vegetable Crackers) and an assortment of peppers, olives, chives, salami (or other sliced meat) or some fabulous cheese. And a few mini cookie cutters to make it easier on yourself. 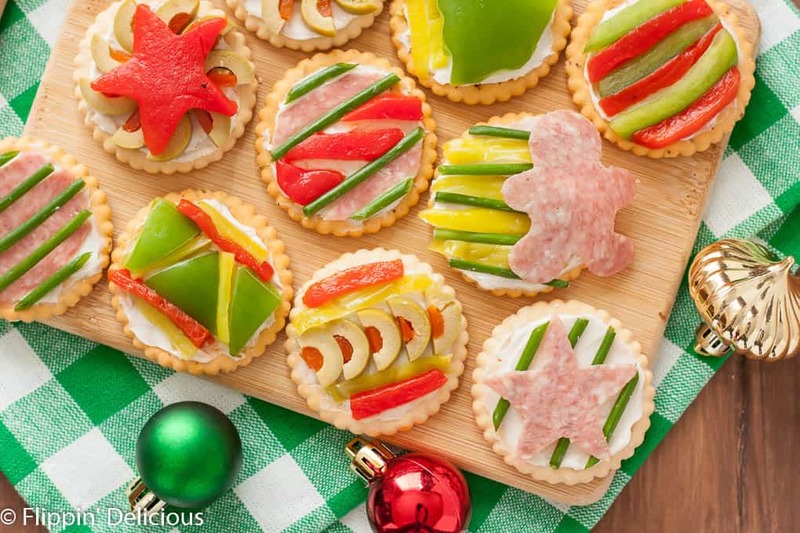 Basically you cut whatever you would normally serve on a meat,cheese, and cracker plate into festive shapes and thin strips. Then your imagination is the limit! 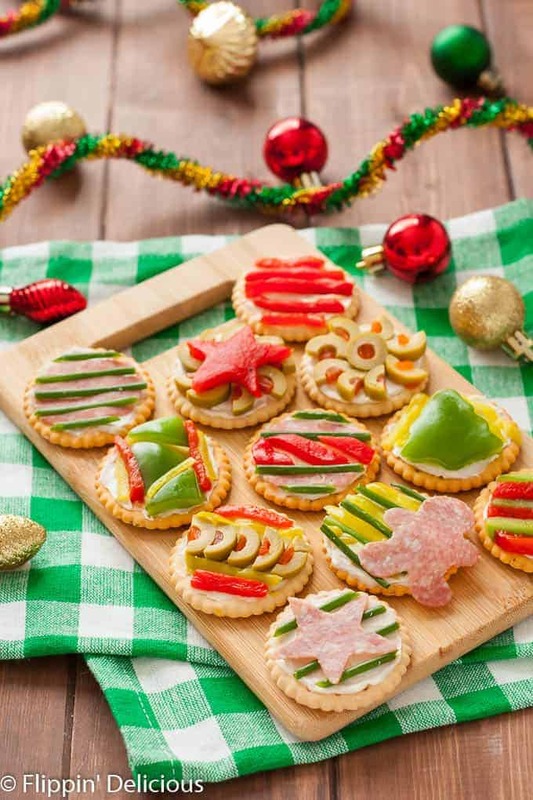 If you are having a ugly sweater party with kids, or with fun adults, you can have everyone decorate their own crackers. Just cut all of the toppings out before hand and then let everyone make their own ugly sweater crackers! 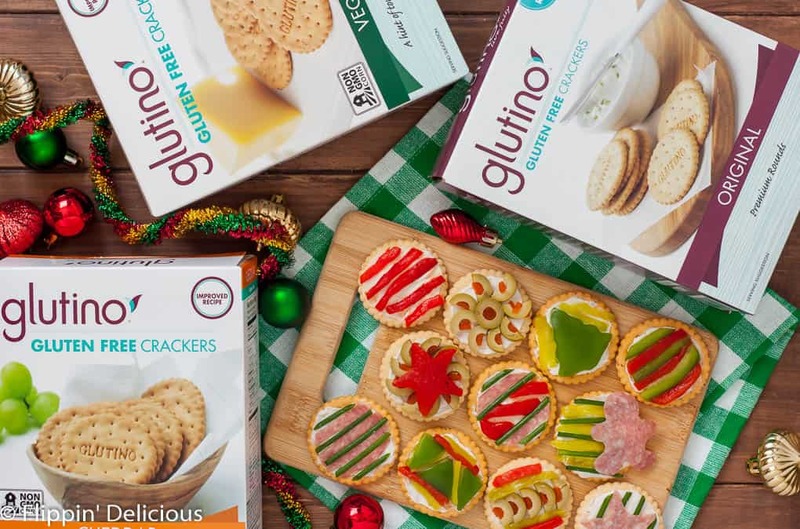 Get 2 coupons for $1 off any Glutino product, including Glutino Crackers so you can get ugly sweater party ready! 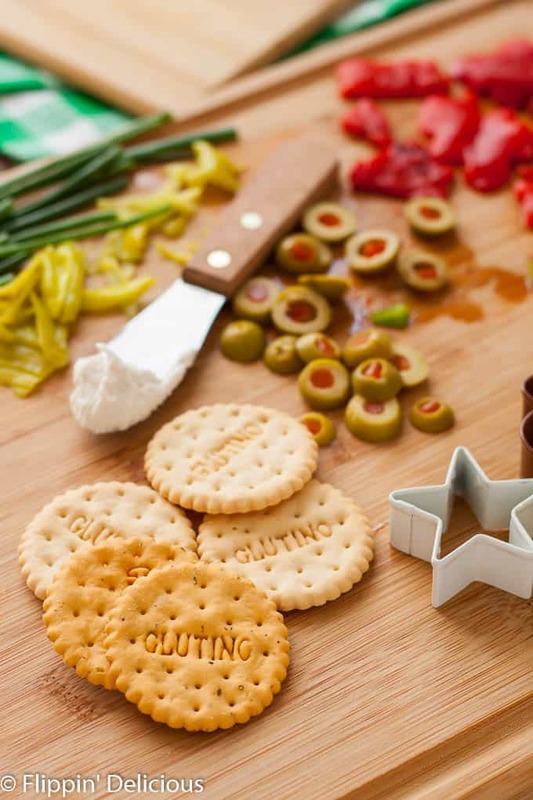 Spread each Glutino Cracker with cream cheese, hummus, soft cheese, or the dip or spread of your choice. 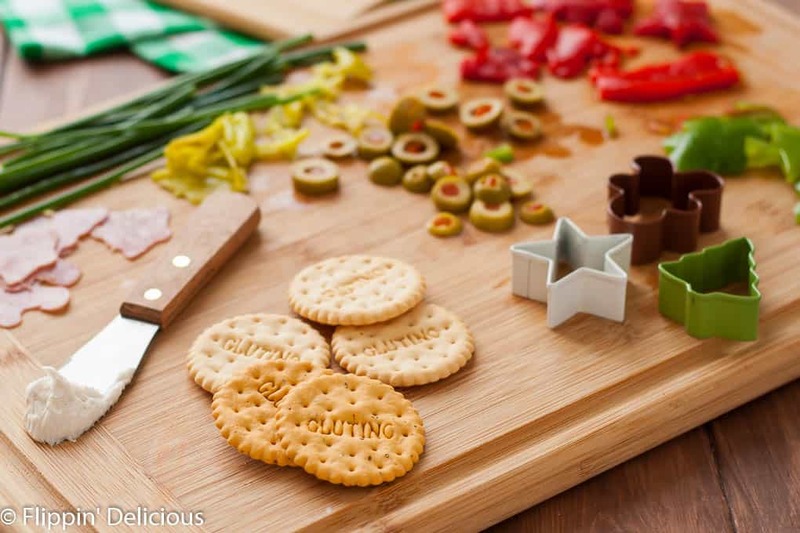 Cut the peppers, olives, meat, cheese, and chives into thin pieces for creating designs, or use mini cookie cutters to make some instantly festive stars, gingerbread men, or holiday trees. Gently press the toppings into the spread to adhere, then serve!